UPDATE: Winners have been selected and have received their codes for free business cards! Congrats! It’s time for another giveaway folks! 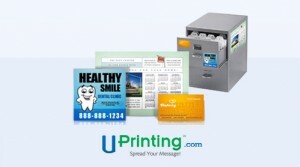 This time around, we’ve got an awesome giveaway from the folks at UPrinting.com. If you’ve never heard of UPrinting, maybe it’s time you checked them out. BusinessCards.org recently performed a faceoff of sorts and UPrinting scored pretty well. 3rd for Overall and 1st for cheapest cards. In their notes, they said that UPrinting delivered sturdy cards with good packaging and quick shipping. And, now, you have a chance to win some to test them out for yourself! Let’s get down to the details. Limited to US residents 18 years old and above only. Get another bonus entry by going to UPrinting’s Facebook page and clicking on the Like button there. Then, when you’ve done one or all three of those things, come back here and leave a comment telling me which you did so I can count your entries. To recap, here’s how you enter. Entries will close on May 6th at 11:59pm CST. I’ll tabulate the entries that weekend and then announce the winner the week of the 9th. (On the off chance that there aren’t two entrants to choose from, there will only be as many winners as there are entrants up to two winners.) What are you waiting for? Go get your entries! This giveaway is sponsored by UPrinting, no monetary compensation was given. Check out more information about die cut business cards and business card magnets on UPrinting Facebook.